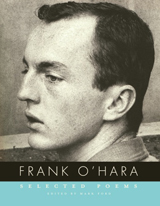 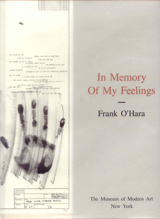 New edition of In Memory of My Feelings: A Selection of Poems by Frank O’Hara, edited by Bill Berkson. 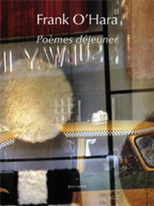 Preface by René d’Harnoncourt. 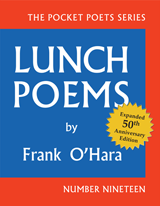 Art for the poems by Nell Blaine, Norman Bluhm, Joe Brainard, John Button, Giorgio Cavallon, Allan D’Arcangelo, Elaine de Kooning, Willem de Kooning, Niki de Saint Phalle, Helen Frankenthaler, Jane Freilicher, Michael Goldberg, Philip Guston, Grace Hartigan, Al Held, Jasper Johns, Matsumi Kanemitsu, Alex Katz, Lee Krasner, Alfred Leslie, Roy Lichtenstein, Marisol, Joan Mitchell, Robert Motherwell, Reuben Nakian, Barnett Newman, Claes Oldenburg, Robert Rauchenberg, Larry Rivers, and Jane Wilson. 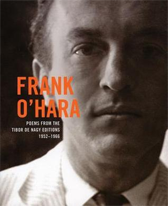 Published by the Museum of Modern Art, New York: November 2005.